Spring is easily my favorite time of year. Fall is a very close second and no one can deny the enchantment of the newly crisp autumn air and the turning and falling of the leaves. But for me it is the bursting color and rebirth of spring that enchants and excites me the most. Being born in April, perhaps I have something of a natural bias. In my nearly thirty-three years on Earth, this spring is by far the one I have looked forward to the most. The past year of my life, and especially the fall and winter months, have been the heaviest, darkest and most anguished ever so my very soul has been absolutely parched for the spring rains and fresh, bright blossoms. The ice and snow have melted and are cascading in rivers of renewal and revitalization. The winter solstice has its potential as a type of new-year marker, but the days are still cold and dark and the thaw is still a long way off. Yet in terms of both the seasons’ cycle and the zodiac, the spring equinox is arguably THE true, natural new year. This awakening time is far more ideal for setting goals and intentions, for clearing away those last cobwebs of winter and the heaviness of hibernation. We don’t have the luxury of literally hibernating like bears, or even as our distant ancestors used to, but there are parts of us that we let sleep; goals, hobbies, intentions, and pursuits that are more likely to lay dormant during the colder half of the year. What in your life is stirring from its slumber? The image of the bellows in a forge comes to mind. The Air, the breath, blows and arouses the coals within the firepot, where a balance must be maintained for the ideal conditions for various kinds of work. Is a high, hot flame required, or a lower, steadier burn? What is it that you want to create and cultivate this year? What do you want to forge? Look back over the past six months or even a full year. What kind of crucible have you endured to get here, or are you perhaps still enduring? A crucible is defined literally as a heat-resistant container in which metals and/or other substances are melted down, as in smithing or in chemistry, and figuratively as a very challenging time or severe trial that acts as a refining or hardening process. In both definitions, it is a tool of creation. So this year, between the opposition of the Aries Sun and Libra Moon – doubly fiery masculinity and harmonious emotional femininity – I see a potent, elemental forge of creation in which balanced emotions and life-supporting nurturing must work together with passion, action and the sparks of initiation. Inspiration and illumination are everywhere now! Both Aries and Libra are cardinal signs, so this is a time of beginnings in every way imaginable. Aries is all about the Self and personal identity. Aries is “I Am”. It begins with you. Work on yourself, forge yourself, create and define yourself and then, and only then, can you fulfill whatever it is that you’re here to do and to help others with. This is a great time to be selfish! The healthy, necessary kind of selfish in which you make sure that you are taken care of so that you are able to help others. The Tolkien nerd in me immediately thinks of Legolas urging a battered Aragorn to rest at Helm’s Deep, saying “You’re no good to us half-dead.” No one is good to anyone half-dead! Or half-broken, half-asleep, half-healed, half-true or half-assed. So tend to your forge. Let your emotions fuel your creativity and your passion, but don’t let them flare those flames up beyond control. Be smart with your feelings and think about how others feel. The Moon is emotions and intuition but Libra is Air – intellect, thought, reasoning. So there is a double theme of balance. First the heart and the head must be weighed against each other, and then together against motivation and action. If Aries is “I am” and Libra is “I balance”, then an ideal mantra, affirmation or helpful reminder for this equinox, and therefore moving on through the year, is simply – “I AM BALANCED”. But while Fire is the predominant element of spring, and despite the Libra full Moon, Water has a great deal of energy and advice to offer at this time as well. As mentioned earlier, the waters of spring, at least mostly, are the melted snows and ice of winter. Everything that was in stasis during the past few months is now released and is flowing freely to nurture the new shoots and blossoms that waited patiently beneath the earth. Keeping in the theme of balance, Water is the natural complement and balancer of Fire. In fact, water plays a direct and important part in the forge as well, in the slack tub. This is where the hot metal that is being worked is quenched and tempered. So while you are working the bellows to stoke the flame within the forge, be sure to temper your goals, your work, and indeed yourself with the waters of intuition, cleansing and truth. I can’t put enough of an emphasis on truth. Now is not the time for delusions, deceptions, or pretenses of any kind. When is it ever really the time for such things, to be fair? But this equinox marks the beginning of a time that will be very revealing and telling, at least for the next few months. Diotima Mantineia of Urania’s Well gives a very helpful and much more detailed look into the astrological factors suggesting this. This cautions us to be all the more careful, thoughtful and deliberate in what we create. Mercury, the chart ruler of the equinox, is still retrograde until the 28th and in its detriment in Pisces, no less, conjunct the deeply illusive ruler of Neptune, Pisces. This is where the very potent and abundant influence of Water comes in for this equinox. Confusion and miscommunication are sure to still abound. As we move into a time that spurs us into action, we must take care to think and plan first, and to be ready before driving on. And be ready for some surprising revelations. While Water’s energy can obscure, confuse and bemuse at this time, it can also help to enlighten and clarify. Water is a complex element representing a complex factor of human existence – emotion. Ultimately one’s emotions can be their downfall or their saving grace. We are emotional creatures, there is no way around this. We are heavily influenced by our emotions, often far more than we are by our thoughts. This is why the watery Moon in Libra, as mentioned earlier, urges us to balance those thoughts and emotions before sparking into the action and passion so supremely represented by the Sun in Aries. I love the Sabian Symbol for the first degree of Aries – A woman just risen from the sea; a seal is embracing her. How appropriate that the symbol for the moment that the Sun enters Aries, which seems so supremely fiery, is actually a very watery and feminine image. This sings to me personally for obvious reasons, but also reinforces the equally watery nature of spring and its initiation. The fact that fire is required to turn hydrogen and oxygen into water echoes and indeed proves the wonderful, mystical and inherent connection between these two elements. So that brings us to the oracle of the element of Water for this powerful portal and creative forge of the spring equinox and the full Moon. It has taken me some time to sort out and hone the methods and sources through which I receive these Water oracles, and my goal now is to share one for each new and full Moon every month. I have used various Tarot decks, the mostly lovely but also very lacking “Oracle of the Mermaids” by Lucy Cavendish, and the occasional rune(s), always paired with astrology and channeling or journeying or simply observing nature. This time I used a very unique, custom deck that consists of the artwork of the arguably most popular pre-Raphaelite painter, John William Waterhouse, and is available from a Tarot reader/artist/designer known as Seven Stars. I bought my deck from her Etsy store. Waterhouse is one of my all-time favorite artists and I had actually long thought that his work would make a terrific intuitive oracle deck, so naturally I had to buy Seven Stars’ creation as soon as I discovered it. Out of seventy-five cards you have the flexibility to create one or more unique decks consisting of the paintings you want. Needless to say it is all very Watery on the whole (and can it be more perfect that his name is Waterhouse? 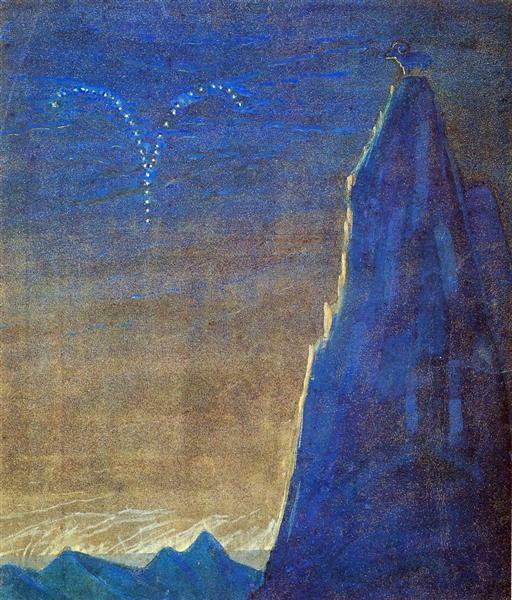 ), but many works are especially heavily themed around Water and connected myths and legends. It is the perfect “Oracle of Water” deck, certainly until I finally succeed in creating my own. This reading is intended to elaborate on the more general oracle message for the month of March overall, which had a slight focus on the new moon on the 6th, and to now focus on the equinox and the full moon and the effects they will have on the months to come. When I read these cards I consider the actual subjects and the stories behind them and slightly more do I focus on the imagery itself and the intuitive feelings that arise from them. The myth of the Danaides is a considerably dark and sad one, and tells of the fifty daughters of the Libyan king Danaus who all (but one) kill their husbands, the fifty sons of Aegyptus, on their wedding night. In many later versions of the story, the daughters are then condemned in Hades to perform the futile task of trying to fill a leaking tub for all eternity. The daughters are often considered to be water-nymphs and their task related to ancient ceremonies of water worship. There are many layers and messages here but many can be summed up most basically into futile actions that clearly result in and/or from imbalances and poor choices, as well as in concepts of justice and cause & effect. In the myth, the daughters were commanded by their father to kill their husbands once he decided he did not actually want to relinquish any of his kingdom in this way to Aegyptus. On the one hand, they were compelled to obey their king and father. On the other, they still had a choice, and in the end they were punished for that choice. I also see insanity in this card, in the action of constantly carrying and pouring water into a vessel that can never be filled. Everyone knows that “insanity is defined by doing the same thing over and over while expecting a different result”. They know they will never fill that tub yet they continue to try. What have we perhaps been doing that is futile, useless, wasteful and repetitive while still expecting something different to happen? Every equinox and solstice and every full (and new) moon is a great time to reflect, evaluate, and decide what needs to be stopped or let go of if it no longer serves. Consider also what you have been constantly giving of yourself to, how you have been pouring yourself out but never replenishing or getting anything back for what you are giving. How can you restore balance and make sure that none of your gifts, efforts or intentions are being wasted? Or, in what ways or areas have you been excessively emotional? Have you been dumping your woes onto others or lashing out at them, while not willing to listen to them or consider their feelings? We also need to consider if we currently have a situation or are struggling with something we deserve based on previous choices and actions and injustices. Every action has a reaction, every choice a consequence, every cause an effect. In earlier versions of the myth, the daughters are purified of the murders of their husbands by Hermes (Mercury) and Athena. Interesting that Mercury is the ruler of this equinox and, again, retrograde. What do we need to review and correct? What do we need to purify or make amends for? If there is nothing that you have done to harm another, perhaps you have been harmed and so need to forgive or at least let go, thereby still purifying yourself of whatever has wounded you and has been holding you back. Chiron, the Wounded Healer, is also in the early degrees of Aries at this time and so lends his healing and restoring energy to the equinox. Spend this equinox not only planting seeds and setting goals for the future, but reviewing how you got here and carefully conserving and allotting your resources and energy so you don’t waste any or fall into imbalance. Water those seeds and intentions with truth, awareness and harmony and watch them flourish and grow! Here is a personal favorite and an especially appropriate song for this time of year!